London's bus maps have taken a turn for the better. You may not have noticed. Most people don't use bus maps, they either know where they're going or they 'do a search' and get their directions spoonfed to them. But TfL do provide three different kinds of bus map capital-wide, and one of these has recently changed to show Hail & Ride sections in full and glorious brown. 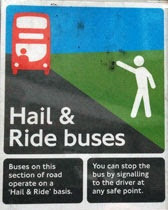 It's quite important to know where the Hail & Ride sections on a bus route are. If you're on board an electronic voice chirps up to announce the start and finish, generally accurately. But if you're standing in the street there are no bus stops, only the occasional information board, so you might not realise you were on a particular route until a bus went sailing past. You may not care. Hail and Ride sections generally run along quiet residential roads or narrow lanes, and anyone who lives nearby probably knows of their existence already. But in the interests of transparency and convenience, not to mention practicality and usability, it's damned good to know where these Hail and Ride sections exist. The maps getting the H&R treatment are the quadrant maps (NW, NE, SW, SE), produced in paper and pdf format, and updated by TfL's cartographers approximately every nine months. They're works of art, continuing a long tradition of London-wide bus maps stretching back decades, and can be picked up from Travel Information Centres, bus station windows and an increasingly diminishing list of other places. Previously these maps showed roads with regular bus routes in grey, and routes with only non-TfL buses in green. But with January 2015's update came the recolouring of every Hail & Ride section in a sort of coppery maroony reddish brown. They look like arteries pulsing through the suburbs, and it's fascinating to finally see visual confirmation of where these individual H&R sections actually are. The first thing that strikes you if you spread these maps out across a very large table is how Hail and Ride is focused far more in certain parts of the capital than others. Central London misses out, as do Tower Hamlets and Newham, and Harrow and Southwark barely feature. In contrast Barnet and Enfield are H&R hotspots, while Sutton appears to pulse blood red. A lot of Hail and Ride sections are revealed as wiggles round housing estates, part of TfL's commitment to route buses within 400m of almost everyone in the capital. Examples of this include the H2 and H3 round Hampstead Garden Suburb, the W12 through Walthamstow Village or the G1 on Battersea's Shaftesbury Estate - this the closest H&R to the centre of London. Other Hail and Ride sections are longer runs, often down rural lanes where flagging down a bus makes more sense than installing widely-spaced stops. The 399 from Barnet to Hadley Wood is an extreme version of this, its route being almost entirely H&R, while the Hail & Ride kings are the R5, R8 and R10 serving the outer extremities of Bromley, where there are no bus stops for miles. Or perhaps the true Hail and Ride champions are those routes which dip into stoplessness on more than three occasions. The 434 via Coulsdon and the 499 around Romford have four distinct H&R sections (as do the 384, G1, S1 and W9). The 424 in Fulham/Putney ticks the H&R box five times, while Kingston's K5 and Sutton's S4 up the bar to six. But the winner as far as I can see is the S3 from Maldon Manor to Sutton Hospital, which serves a Hail and Ride section no fewer than seven times. Sutton certainly seems to scoop the prize for the most tortuously communal bus routes. I thought I'd create a Hail & Ride bus map of my own. It's approximately geographical, based on smaller divisions than the published quadrant bus maps. Where buses barely go Hail & Ride at all I've used brackets, and where they go into Hail and Ride a lot, or cover lengthy sections, I've used bold. It's all terribly subjective, and potentially incorrect too, but it should give you a general idea. Hail and Ride's a very north London and southeast London thing, and not an especially central or east London thing at all. It's very much the province of lettered buses, and of 300- and 400-and-something buses, and nothing that double-digit buses ever do. And whilst it may not be especially interesting to delve into in such unnecessary detail, these services are an important part of life in the suburbs, so it's good to see them depicted and celebrated cartographically. I'm delighted that TfL have introduced a thoughtful and informative update to their quadrant maps, rather than some marketing wallah deciding that all New Routemaster routes should be in gold, or some such travesty. I'm pleased that somebody's thought about Outer London for once, rather than always concentrating on the middle. But above all I give thanks that these paper maps still exist, in full technicolour glory, for those of us who choose to plan our own journeys rather than have some algorithm choose it for us.